The Lexmark Optra T644 printer operates with a monochrome laser and suitable for most businesses and small, work groups. The swift print speeds and performance suits most business goals. The printer offers a decent amount of security management features and simplifies the process of operating the printer's flexible services. The networking features of the printer will work for an office, home, small or large business, and an enterprise. Lexmark created the Lexmark OptraT644 monochrome laser printer, and the printer has a print speed of 50 pages per minute for standard documents and 47 pages per minute for A4. The first page will come out in less than 10 seconds, but after the first page, it takes only a minute for the rest of the loaded documents to print. The resolution is more than admirable with 1200 x 1200 dots per inch for quality images. The resolution of the printer is a minimum of 600 x 600 dots per inch. The monthly duty cycle is recommended up to a whopping 250,000 sheets; that is a quarter million documents it can print out safely. 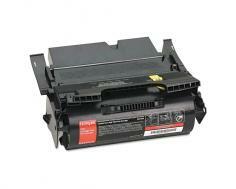 The best feature of the printer is its capacity to be flexible in large networked offices. There is a fair amount of options in connectivity to suit the network capability. The internal optic fiber 100Basefx will ensure everyone will get more than enough data capability, and will be divided into the number computers on the network. If you do not need that much power, you can utilize the Ethernet/100BaseTX for smaller companies. The optional network cable ports are Ethernet 10/100BaseTX, internal Gigabit Ethernet, and internal 802.11g wireless. The internal Ethernet and Fiber ports can be used for any printer feature. A USB 2.0 port and USB Direct interface on the operator panel are ideal for a single host node. It is strange the printer is only 16 in height, 17.2 inches in width, 20.6 inches in depth, 57 pounds and can print pages in less than a minute with a safe operating range of 250,000 pages a month. 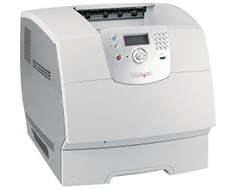 The Lexmark OptraT644 printer will be compatible with operating systems Windows 98 and higher, Novell, Unix, and Linux. The printer comes with a warranty of up to one year. You will find the necessary drivers and utilities in the CD, a quick reference guide, setup guide, and a return program for print cartridges inside the package. Virtually any paper can be used with the printer. The media types are diverse for the printer and can dish out most material that modern companies need. The T644 Series incorporates flexibility in RAM memory. The options for expandability are 128 Mega Bytes, 256 Mega Bytes, 512 Mega Bytes and the maximum capacity of RAM allowable is 640 Megabytes. The processor facilitates 514 MHz, which is kind strange, considering the maximum RAM it utilizes. The optional hard disk of 40+ Giga Bytes is more than needed for small businesses. The Lexmark T644 printer handles a 500 page input tray, 100 pages for the multipurpose feeder, 500 pages for the sheet duplex, and 250-500 pages for a sheet drawer. The 2,000 high capacity feeder would be ideal for large enterprises. If that is not enough, you can opt-in for an additional 250 or 400 universal tray with a drawer. The external Token-Ring can only be utilized with prints. The downside of connectivity should be noted; the external port for the Ethernet and external Token-Ring are used for prints only. It does not make much sense to have a document feeder capable of taking on 500-2000 pages, while the document output bin can hold only 500 sheets. The printer can virtually utilize any media, with an exception of poster sized documents. 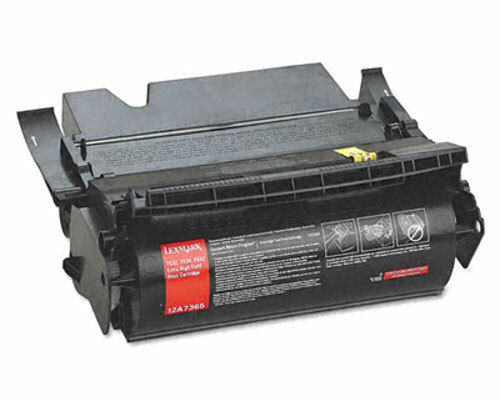 Review it: "Lexmark T644 "
Toners designed for the Lexmark T644 Series can be the T64x Print, with a yield of 6,000 pages, or the T644x High Yield with a yield of 21,000 pages. The T64x Return Program Cartridge has a yield of 6,000 pages, and the T64x High Yield Return Program cartridge has a yield of 21,000 pages. The T64x High Yield returnable print label cartridge has a yield of 21,000 pages, and the T645 Extra High Yield returnable cartridge has a yield of 32,000 pages.